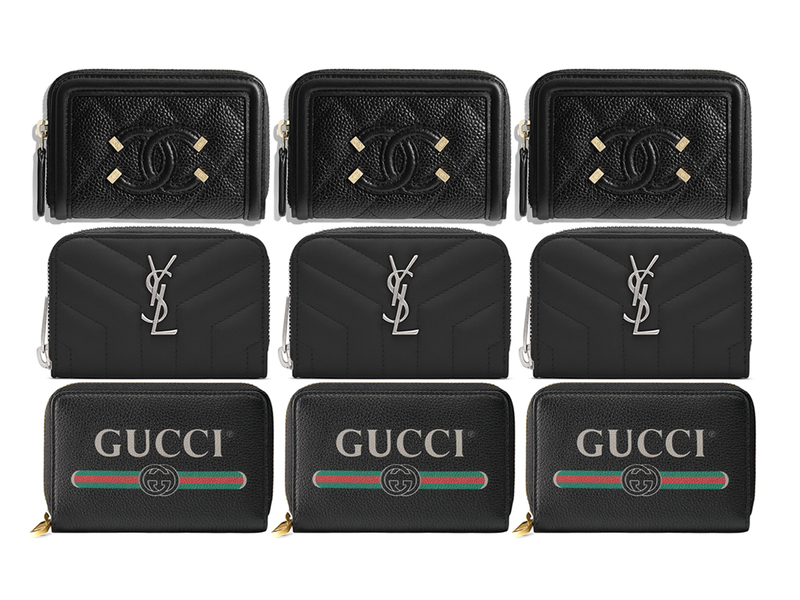 Designer bags are getting tinier lately, and it can get difficult trying to fit your favourite continental wallet (yes, the large ones that hold a month’s worth of receipts, stacks of cash and 12 cards you don’t necessarily need) within. Thankfully, luxury brands are slowly (but surely) adopting a similar trend in the SLG department, releasing smaller purse options such as this trio above. They all come in full leather, carry iconic elements of the respective brands, and are furnished with 3 compartments sealed within a zipped closure, so it’s down to choosing the one that truly speaks to your heart. First up, Saint Laurent’s Loulou Zip Coin Purse (SGD530) that comes in 100% lambskin and measures 11 cm by 7 cm. The quilted pattern actually comes together to form a subtle Y logo, while the interlaced YSL initials in oxidised nickel gives it just the right amount of edge. Contrary to its name, you can even slot folded cash along with a couple of cards within if you wish. Next, Gucci’s Print Leather Card Case (SGD670) that features the vintage print referenced from the 80s plastered right in front. Measuring a tad bigger at 12.7 cm by 7.6 cm, this one’s finished with antique gold-toned hardware and available in two other colours, Pink and White, though we think the best (and safest from wear) would be the one in Black. Last, but by no means least, Chanel’s Card Case (SGD1110) that kind of reminds you of a mini version of the popular Vanity Case. From the grained calfskin to the double ‘C’ interlocking logo that’s finished with gold-toned metal hardware, this baby is perfect for those who can’t get enough of the French luxury house. Wait, that technically means everyone, right?